You will code, build, and execute a program that will use looping to determine the score for a diver based on individual judge’s scores. 1. Become familiar with the using an array. 2. 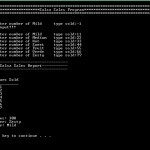 Populate an array with data. 3. Be able to debug a program of syntax and logic errors. 4. Be able to use the debug step-into feature to step through the logic of the program and to see how the variables change values. If you are using the Citrix remote lab, follow the login instructions located on the lab area in Course Home. Locate the Visual Studio 2015 icon, and launch the application. You need to store sales for seven differnet types of salsa: mild, medium, hot, sweet, fruit, verde, and zesty. You will need two parallel seven element arrays. An array of strings to hold the salsa names and an array of integers holding the number of jars sold during the past month for each type of salsa. Create a string array, and initialize it with the salsa types. The program should prompt the user to enter the number of jars sold for each type. Use input validation with a loop to ensure that negavie values are not input. Once the data is input, the program should display a report that shows sales for each salsa type, total sales (total number of jars sold), and the names of the highest and lowest selling products. Lab hints: When writing this lab, you will need a for loop to enter in the sales numbers and a nested while loop within it to ensure the number entered is greater than 0. After reading in all the sales, you will need another loop that will calculate the total number of jars sold. It will also evaluate the low and high sales. You will need to code something like this to keep track of which index contains the high sales product: if (sales[i] > sales[hiSalesProduct]). You also need to have your program process multiple divers. Put this in an outer loop. After you process the information for one diver, prompt the user if she/he wants to process another diver. Allow the user to type either a Y or y to enter another diver’s information; otherwise, exit the loop. Write an event summary by calculating and displaying the average score for all divers and the total number of divers participating. Garbage in Garbage Out (GIGO): The data being entered by the user needs to be validated. Scores by judges may range between 0 and 10. If the user enters an invalid score, display an error message, and prompt for the score again. Keep doing this until the user enters the score correctly. The degree of difficulty may range from 1.00 to 1.67. Using the pseudocode below, write the code that will meet the requirements. Display the sales for each type of salsa. 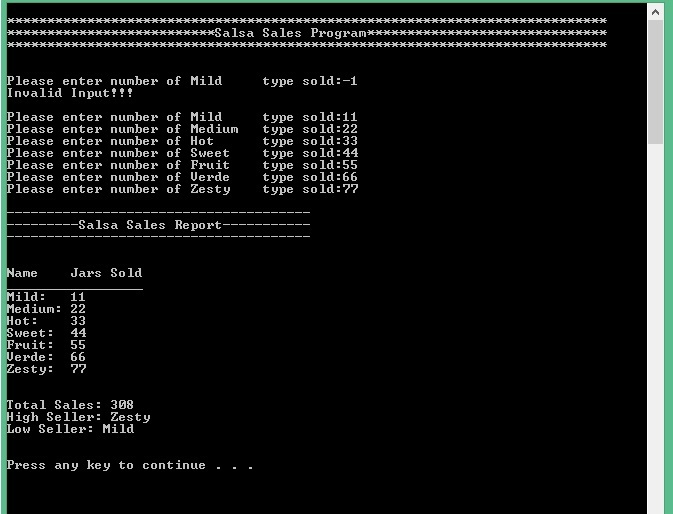 Display the total sales, salsa with the highest sales, and the salsa with the lowest sales. Create a new project and name it LAB3. Write your code using the Processing Logic in Step 2. Make sure to save your program. To compile the program, click Debug then Build solution (F7). You should receive no error messages. If you see some error messages, check the code above to make sure you didn’t key in something wrong. Once you make your corrections to the code, go ahead and click Build >> Build Solution again. Once you have no syntax errors, to execute or run your program, click Debug on the menu bar, and then click Start Debugging. 2. Copy your code and paste it into the same MS Word document that contains the screen print of your output. 3. Save the Word document as Lab03_LastName_FirstInitial.